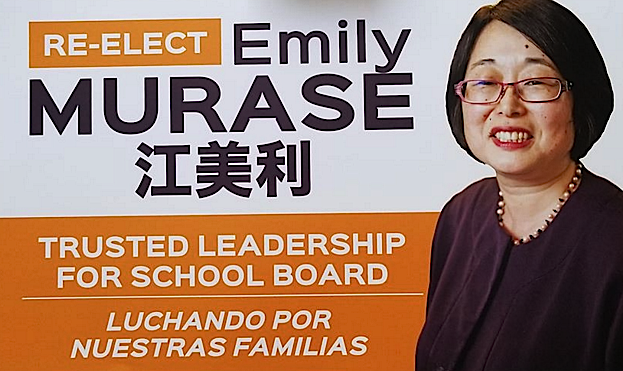 SAN FRANCISCO — Emily Murase, a member of the San Francisco Board of Education who has been running for re-election, posted the following message on Aug. 16. I have some terrible news. I will not be on the November 2018 ballot. The Department of Elections has disqualified my filing for re-election to the school board because I had relied on mistaken deadline information I received from Elections Department staff. I have decided not to take the case to court because, as a department head for the City & County of San Francisco for my day job [Department on the Status of Women], I do not wish to sue another department. I have exhausted all other avenues to challenge my disqualification. Obviously, I am devastated by the situation. So many of you supported me this election cycle. I want to express my deepest appreciation to each and every one of you. My term on the school board will conclude on Dec. 31. The past eight years on the school board have been some of the most stimulating and fulfilling of my life. I am very proud of my record. On Tuesday, Aug. 14, the first school board meeting of this school year, the board heard a presentation on Middle School Redesign, which incorporated many of my priorities: an opportunity for all students to access electives, capacity for students to study world languages and the arts, common planning time for educators. In honor of my parents and the founders of the Japanese Bilingual Bicultural Program, I have dedicated myself to expanded funding for world languages, and secured what is now $3 million in enrichment funds for this purpose. As board president in 2015, I co-authored the landmark African American Achievement Leadership Initiative board resolution, and connected the underfunded African American Honor Roll Celebration with corporate sponsors. I have championed the proposed SFUSD Arts Center at 135 Van Ness for many years. Recently, I worked with my board colleagues, labor partners, and the voters of San Francisco to deliver a 25% salary increase to our hard-working educators. But I want to keep things in perspective. This could be a blessing in disguise. After my term ends at the end of the calendar year, what will I do with the 10-15 hours per week I devoted to school board business and meetings above and beyond my full-time work? Binge-watch “This Is Us,” “Madame Secretary,” and “Pose.” Get to know my family again. Izumi has just two short years before she flies away to college (Junko launched last year). I haven’t been tent-camping with Neal for years. I can’t remember the last novel I completed reading. I would like to spend more time with extended family who are advanced in age. Regarding campaign funds, I will be closing my 2018 school board account but I still have some bills to pay, including legal fees associated with trying to get on this November’s ballot. I’d like to keep my campaign momentum going and am planning to run again in 2020, just two short years away! So many people have supported me since 2008 when I first ran for school board (and lost) and again in 2010 when I prevailed and again in 2014 when I was re-elected. Neighbors, former babysitters, teachers, countless friends dating back to Alamo Elementary, Presidio Junior High, and Lowell, extended family, former co-workers, the list goes on and on of the people who got me to this place. Thank you, again, for your deep friendship and support.